So, let’s turn process auditing on. 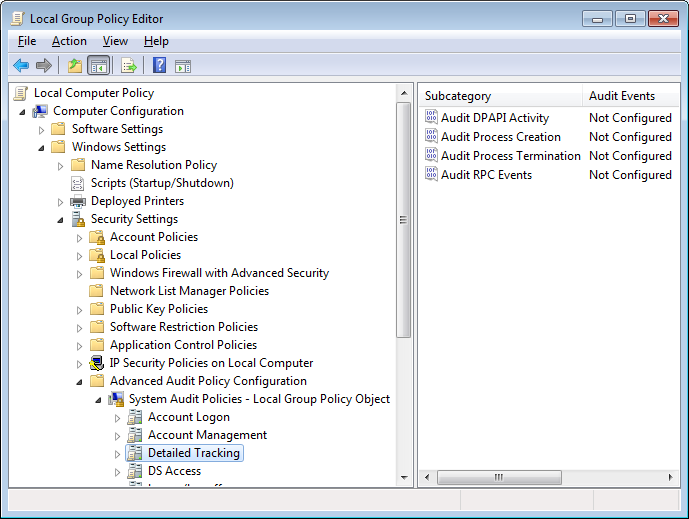 Enable auditing for “Audit Process Creation” and “Audit Process Termination”. That’s an OK log, we know what executed and when, and could trace back the “Creator Process ID” to find the creating process. However, the log is rather long and contains quite a bit of useless information; this will chew up your Splunk (or other log aggregation tool) license in no time. WLS can help us here. It will create key / value pairs from the log, add useful information, and not fill your logs with paragraphs of redundant information. The example below uses my default metadata settings for WLS, the bold text indicates the extra information WLS added to the log. This entry was posted in WLS and tagged event logs, process, Splunk, WLS on March 21, 2013 by digirati82.